Black acrylic holder frame. Months and Dates are screen printed on Polystyrene. Black or White Inserts available. Complete set of months and dates provide with calendar. Calendar set sold individually. Multi-Functional Displays including Perpetual Calendar with Brochure Pockets and/or 8 1/2"W X 11"H Sign Holder. Displays available in Countertop and Wall styles. Displays the Month and Date and your literature and/or promotional graphics in an All-In-One black/clear acrylic display. Calendar Inserts available in black with white copy and white with black copy, both pictured above. Optional Logo/Text Header to create your own personal branding. Displays sold individually. Displays days, months and dates. Aluminum frame with formica engraved inserts, available in single faced calendar and double faced calendar, calendar inserts are stored separately from calendar, calendar inserts slide into top of calendar. Calendar Frames and Calendar Inserts are available in 4 color combinations - Silver Calendar with Black Inserts with white letters, Black Calendar with White Inserts with Black Letters (pictured), Gold Calendar with Black Inserts with white letters, Gold Calendar with Walnut Inserts with white letters. Single Faced Calendar size is 11 1/2"W X 2 1/4"H X 3 1/2"D. Double Faced Calendar size is 11 1/2"W X 2 1/2"H X 3 1/2"D. Calendars sold with frames and complete set of days, months, and dates. Available with cork base or double-coated adhesive base. Replacement Calendar Inserts available with details below. Displays months and dates. Aluminum frame with formica engraved inserts, available in single faced calendar only, calendar inserts are stored in calendar frame with removable top lid. 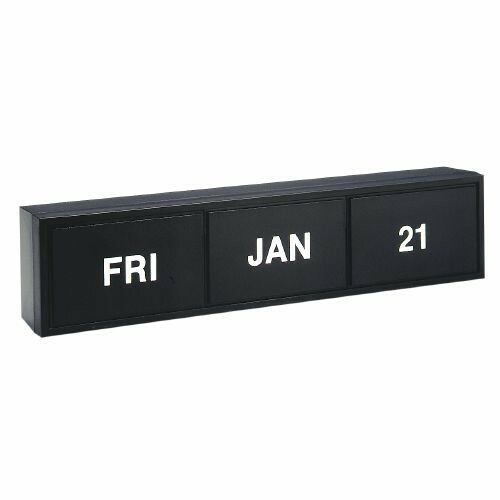 Calendar Frames and Calendar Inserts are available in 4 color combinations - Silver Calendar with Black Inserts with white letters, Black Calendar with White Inserts with Black Letters (pictured), Gold Calendar with Black Inserts with white letters, Gold Calendar with Walnut Inserts with white letters. Single Faced Calendar size is 6 3/4"W X 2 1/2"H X 3"D. Calendars sold with frame and complete set of months and dates. Available with cork base or doulbe-coated adhesive base. Replacement Calendar Inserts available with details below. Displays days, months and dates. 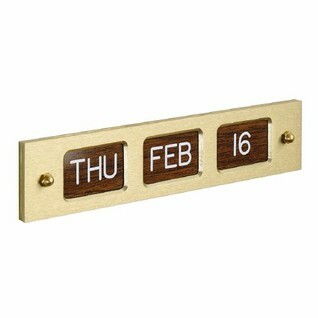 Aluminum frame with formica engraved inserts, available in single faced calendar and double faced calendar. 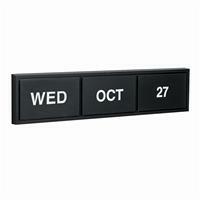 Calendar inserts are stored in calendar frame with removable top lid. Calendar Frames and Calendar Inserts are available in 4 color combinations - Silver Calendar with Black Inserts with white letters (pictured), Black Calendar with White Inserts with Black Letters, Gold Calendar with Black Inserts with white letters, Gold Calendar with Walnut Inserts with white letters. Calendar size is 11"W X 2 1/2"H X 4"D. Single-Faced Calendars sold with frame and complete set of days, months and dates. Double-Faced Calendars sold with frame and two complete set of days, months, and dates. Available with cork base or double-coated adhesive base. Replacement Calendar Inserts available with details below. Displays days, months, and dates. Aluminum frame calendar with formica engraved inserts, available in single faced calendar and double faced calendar. Calendar inserts are stored in calendar frame with removable top lid. Calendar mounted on aluminum base, 22"W X 4"D, with Kable security pens on each side of calendar. 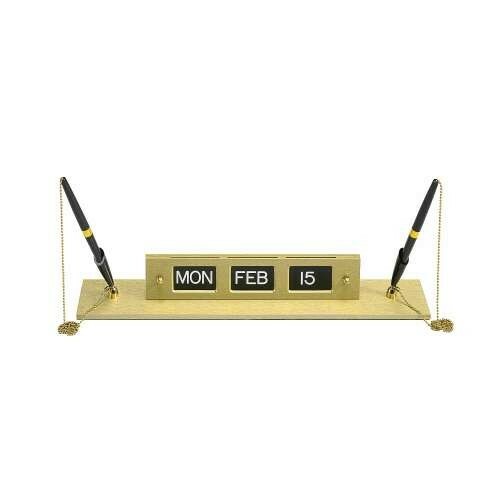 Single faced calendar include complete set of days, months, and dates and two single Kable security pens. 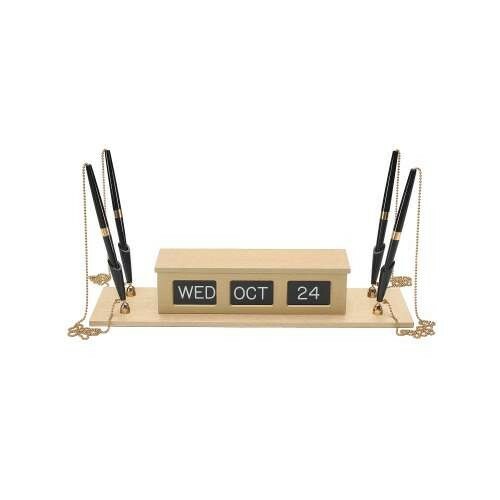 Double faced calendar include two complete sets of days, months, and dates and four Kable security pens. Calendar Frames, Kable Pens and Calendar Inserts are available in 4 color combinations - Silver Calendar and Pens with Black Inserts with white letters, Black Calendar and Pens with White Inserts with Black Letters, Gold Calendar and Pens with Black Inserts with white letters, Gold Calendar and Pens with Walnut Inserts with white letters (pictured). Replacement Calendar Inserts available with details below. Pen Replacement Jumbo Jogger Refills available with details below. Available in Gold Self-Storing Calendar Frame and Base with complete set of days, months, and dates calendar inserts in black with white lettering. 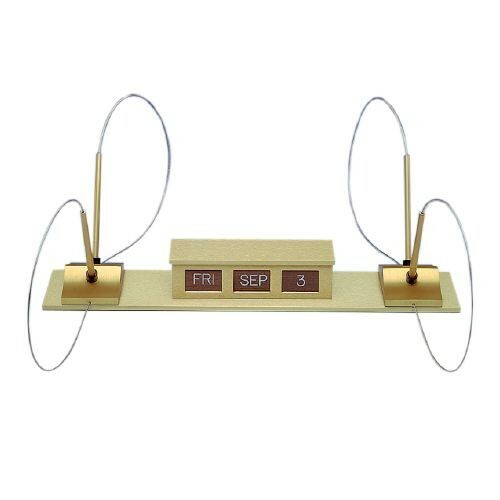 Available in Single Faced Calendar with one complete set of calendar inserts and two swivel pens on each side of calendar or a Double Faced Calendar with two complete sets of calendar inserts and four swivel pens on each side of calendar. Swivel Pens attach to base by chain. Swivel Pen Replacement Pens and Security Ink Refills available with details below. Replacement Calendar Inserts available with details below. Base size 14 1/2"W X 2 1/2"H X 4"D.
Available in Gold Non-Storing Calendar Frame and Base with complete set of days, months, and dates calendar inserts in black with white lettering. 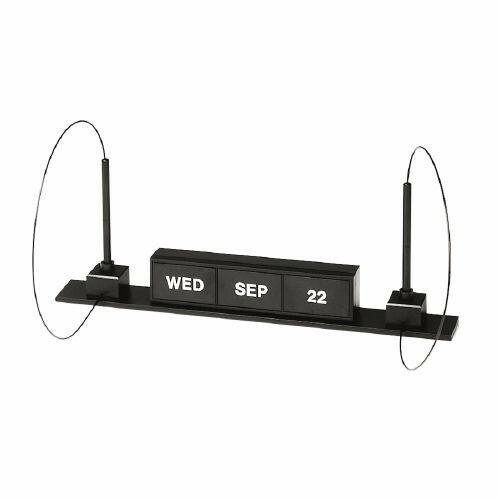 Available in Single Faced Calendar with one complete set of calendar inserts and two swivel pens on each side of calendar or a Double Faced Calendar with two complete sets of calendar inserts and four swivel pens on each side of calendar. Swivel Pens attach to base by chain. Swivel Pen Replacement Pens available per request. Security Ink Refills available with details below. Replacement Calendar Inserts available with details below. Base size 15 1/2"W X 1/4"H X 3"D.
Aluminum Non-Storing Calendar Frame with complete set of days, months, and dates calendar inserts. Single Faced Calendar only. Calendar Frames and Calendar Inserts are available in 4 color combinations - Silver Calendar with Black Inserts with white letters, Black Calendar with White Inserts with Black Letters, Gold Calendar with Black Inserts with white letters, and Gold Calendar with Walnut Inserts with white letters (pictured). Calendar size is 9 1/2"W X 2"H X 5/16"D. Mounting options available with recessed screws in back or with double-coated adhesive back. Replacement Calendar Inserts available with details below. Formica engraved inserts available in sets of Days, Months, and Dates. Calendar Inserts available in 3 colors - Black with white letters, White with black letters, and Walnut with white letters. Individual calendar inserts are available per request. Inserts magnetically held in frame. Inserts are silk-screened with 1/2" Helvetica Medium typeface. Calendars come with a complete set of days, months, and dates inserts. Available in both Counter and Wall styles. Black with white lettering. Size 9"W X 2"H X 3/8"D. Available with double-coated adhesive back, velcro back, or screws for mounting. Size 9"W X 2"H X 1 3/8"D, Single faced calendar only, available with cork base or double-coated adhesive base. 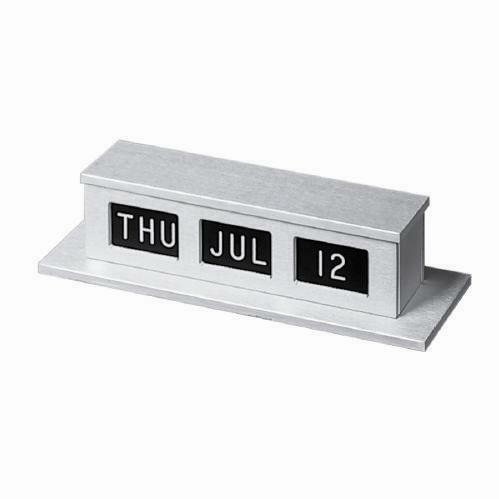 Magnetic Perpetual Calendar includes a complete set of days, months, and dates inserts. Unit is an aluminum base, 17 1/2"W X 2"D, with two cube base Sentry Pens with cable connector on each side of calendar. Single faced calendar only. Black with white letters calendars. Pens and Base black color only. Replacement calendar inserts available with details below. 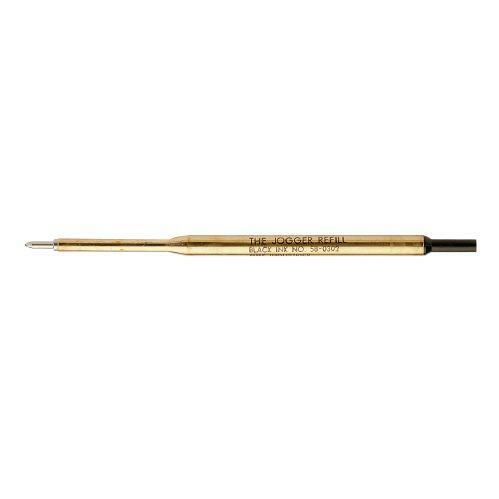 Pen Replacement Jumbo Jogger Refills available with details below. Replacement Magnetic Inserts available in complete set of days, months, and dates or individual day, month, or date inserts per request. For Kable and Sentry Pens above. Extra capacity refills write twice as long as standard refills. Carbide tip construction. Available in Blue and Black ink and with Fraud-Resistant Security Black Ink to protect against tampering from check washing and document fraud. Packed 10 refills per pack. For Swivel Pens above in addition to most desk and pocket pens. Carbide tip construction. Available in Blue and Black ink and with Fraud-Resistant Security Black Ink to protect against tampering from check washing and document fraud. Packed 10 refills per pack. **Additional styles of Counter and Wall Perpetual Calendars and Displays are available, for details use Contact Us tab on our website or contact Roger Zavodny directly by e-mail at roger@myvaultllc.com or by phone at 440-346-4593.